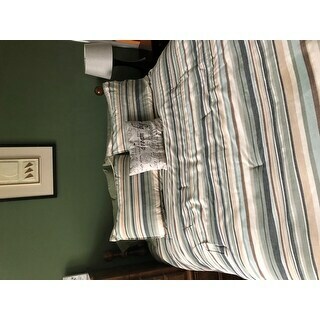 This is the second Tommy Bahama comforter set purchased on Overstock. The image depicted on the product is exactly what this set looks like. Tommy Bahama materials and fabrics are among the best. The craftsmanship is never a disappointment. I will continue to return to Overstock if I ever need to purchase another comforter set. Thank you Overstock for another great deal and super fast shipping! Add effortless style and casual comfort to your bedroom with this cotton yarn dye stripe ensemble in a natural inspired palette of Sea Glass blues and Khaki Sand neutrals on an Ivory ground. 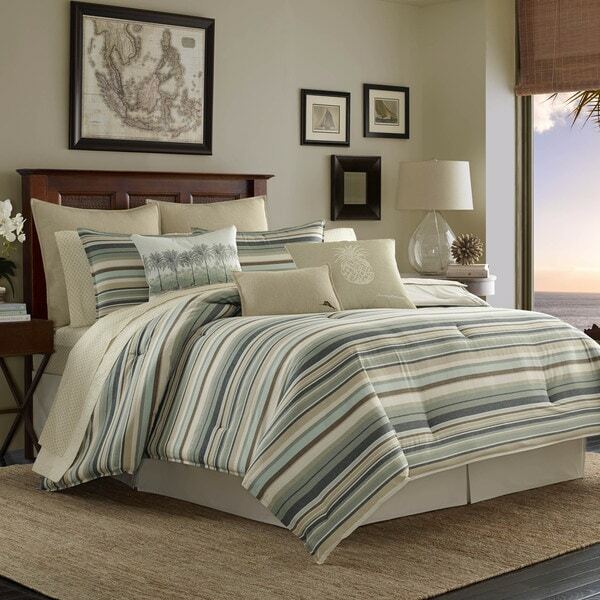 The woven stripe comforter reverses to a tonal khaki texture print that also appears on the bedskirt. The flanged edge on comforter and shams adds a subtle, tailored finish. I searched and searched for the perfect comforter for our master bedroom and finally found it! I love how this comforter has beautiful shades of green, blue and taupe to tie in with my bedroom decor and tropical themed room. I can't wait to paint my walls green to match one of the stripes. The comforter is soft and I think it will hold up well with my two little dogs also. There is no stitching for them to snag. Awesome Tommy Bahama comforter! Wash and dried perfectly and the colors are exactly as described in the advertisement. I bought the King size and it fit our bed perfectly. You can never go wrong with any Tommy Bahama product and this one is no exception. The quality is fantastic! Would definitely buy this Tommy Bahama comforter again! Just got this comforter set and love it. The fit on my king size bed is perfect and quality of the set is on par for Tommy Bahama. The only downside is I do agree with the other review that the color is not quite as vivid as the picture. I was hoping for more blues but it seems to have more green hue. The dark blue is more a denim shade instead of a navy but I still love it. The colors are exactly as shown in picture. Well made and a beautiful comforter, I would buy it again! This is our second Tommy Bahama comforter purchase. I love the quality and weight of the comforter. We were looking for a set that wasn’t too feminine but had some character to it. This is a beautiful comforter set. The comforter is thick and soft and the colors are beautiful. Bought it for my coastal vacation rental. Perfect. Love this comforter! The colors are perfect for Bedroom in FL. The weight is also great. I could not be happier with this purchase. I would highly recommend it to anybody. The colors match neutral tones very well, but the shams are small and King shams are not available. When laundering, the material gets extremely wrinkled and is difficult to iron out and I don't want to iron . This comforter set has great colors! It looks great in my son's room. I love the fact that it's cotton and machine washable. Bought 2 for matching full size beds. This is lovely. It’s a perfect for! Subtle, but beautiful colors. Great quality. Beautiful comforter. Only issue is that it doesn't wash up the best. It wrinkles so bad!! Incredible product! Holds up beautifully in my inn! Many washed color still looks perfect! Just perfect!!! Never disappointed with the Tommy Bahama brand. Very nice set. It's a perfect weight if you live somewhere it doesn't get very cold. I live in AZ and it's the perfect weight for most of the year except for maybe the summer months. It's a very "beach house" like set, and is very easy to compliment with other store bought items. Quality seams pretty good, although the filling seems a little cheap and tends to bunch up in places.That being said, I would still recommend this comforter set. "I’m confused about the color options. The color appears the same is all pics. What’s the difference between Taupe and Khaki?" "which shams come with it? striped or solid taupe?" looking for an update in my master bedroom going with a nautical / beachy theme. "Do you sell the pillows that are shown?"